Augsburg is one of the oldest cities in Germany, founded in Roman times more than 2000 years ago. The city is known for the "Peace of Augsburg" which settled grievances between religious factions in the 16th century and established religious tolerance in Europe by law for the very first time. Vocational School No. 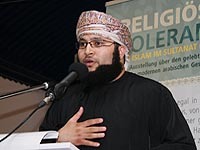 5 in Augsburg, Germany, took advantage of the opportunity offered by the roaming exhibition "Religious Tolerance: Islam in the Sultanate of Oman" and incorporated it into the curriculum of its nondenominational religion classes. 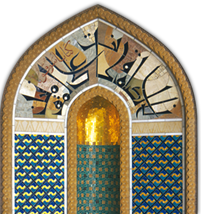 The information was divided into three educational units to provide the religion instructors a teaching aid for finding the similarties between Christianity and Islam. Seven other vocational schools in Augsburg adopted this idea and had their classes visit the exhibition, resulting in more than 10.000 vocational students of the age between 17 and 23 being given the opportunity to learn about Islam and the relationship with Christianity. "Pitch your tents far apart, but keep your heart nearby,"
meaning that it is important to get to know and appreciate each other, with dignity and respect. For Augsburg, the "City of Peace," this is a special -- and historic -- obligation. Oman‘s Ambassador to Germany, Dr. Zainab Al-Qasimiyah emphasized in her speech the importance of religious tolerance for relations between countries and for the Sultanate of Oman. Additional opening remarks were offered by Mr. Martin Neumeyer, the Commissioner for Integration of the state of Bavaria, and by Dr. Nikolaus Hueck and Meinrad Hoerwick, the representatives of the Evangelical and Catholic churches. Mohammed Al-Mamari, representing the Ministry of Religious Affairs of Oman, described the aims of the Ministry, and Mr. Georg Popp of the German-Omani Association, who organized this exhibition, explained how this project came to be. Further contributions to the success of the event were made by the Omani religious singer Anwar Al-Asmi, who delighted the audience with his melodious songs, which dealt with the love of home, country, and the Prophet Mohammed. 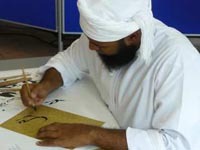 Visitors were also fascinated by the skill of the Omani calligrapher Saleh Al-Shukairi, who wrote the names of the guests in Arabic calligraphy.